DNA Testing and Mx Genealogy: The Molyneux Surname Project. About 100 Mx men, including many IMFA members have had their DNA tested, to apply Y-chromosome results to their study of Mx genealogy. According to researcher Chris Pomery, "DNA testing is proving an effective tool to corroborate the integrity of documented family trees for the simple reason that the DNA [Y-chromosome] signature of each male descendant is passed down from father to son in a manner that exactly mimics the transmission of the surname from one generation to the next. "¹ Your DNA test results cannot, without a paper trail, tell you who your gx-grandfather was. How can it help with your genealogy? Join a community of exciting genetic genealogists. Status and plans for the Molyneaux Surname Project. Three IMFA members are now collaborating to reorganize and administer the project: Jim Molineux (US 329), Wayne Straight (US332) and myself, Steve Mullinax (US 312). Corroborate and/or find errors in documented family trees. Researchers may use any errors discovered to correct or find additional documentation for the relationships. Identify documented family trees that share genetic signatures but for which no documented connection has yet been established. Researchers may then choose to pursue documentation of the connection. Reconsider documentary research efforts on lines which have no genetic connection. Suggest which family lines would benefit from added genetic testing, to corroborate or refute documented connections. We look forward to working with IMFA members and other Mx researchers. ------------ 1. Pomery, Chris, Family History in the Genes, 2007, The National Archives, Kew. UK ISBN 978-1905615124. 2. Bettinger, Blaine T., PhD., "I Have the Results of My Genetic Genealogy Test, Now What", p. 12. Retrieved from The Genetic Genealogist, 12 August 2010. Enter your pedigree on our website at Lines & DNA/Enter Your Pedigree. Email your pedigree (or a GEDCOM file) to our webmaster at webmaster@mx-world.org. We would appreciate hearing from you about any of the following, or about anything else you want to bring up. What information regarding the surname project would you like to see available online? What are your suggestions about the best way to present this information. Give us any feedback you have about how the available online tools have helped or hindered your study. How could these tools be improved? Give us any conclusions they were able to reach using test results. We expect the revitalized surname project to be of great benefit. It will provide researchers a platform to collaborate with others on the project to discover new relationships, help consolidate fragmented trees and guide conventional research. While we would like to see every one of our male members participate we have given special importance to filling the holes in certain lines. These specific lines represent missing pieces to the puzzle that will show the big picture of how the various Mx lines we have identified relate to each other. See if you might be one of our high priority testing candidates that could provide a very valuable service to your Mx cousins. Family Tree DNA offers a variety of DNA tests. IMFA recommends the Y-DNA37 test which typically costs $99 after member discounts. Tests with fewer markers are available but are not definitive for genealogical purposes. This is a male specific test. Results identify the ethnic and geographic origin of the paternal line. It includes a balanced panel of thirty-seven Y-chromosome Short Tandem Repeat (STR) markers. This is the recommended test to trace the paternal ancestry of males for genealogy purposes. The additional markers refine the predicted time period in which two individuals are related and eliminate unrelated matches. A perfect match at thirty-seven markers indicates the two individuals share common ancestry in recent times. When another person shows identical results within the FTDNA database, and if both parties have signed the FTDNA Release Form, then FTDNA will inform them of the match. You will also receive a certificate and report describing the testing process and the meaning of thirty-seven marker matches. 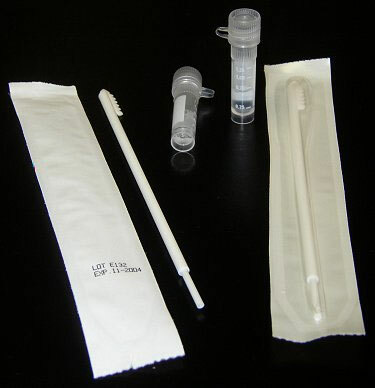 A Family Tree Tree DNA test kit consists of two cotton 'toothed' swab kits, designed for a single persons use. Each tube contains a fluid designed to arrest bacteria growth, so you can scrape your cheek and return your kit in any type of weather (hot or cold). The freshness of your sample will remain intact for months. Remember, a good scrape produces lots of DNA. Your kit also includes instructions for collecting your DNA sample (available in many languages) and the all important Release Form. The Release Form is your written consent that allows FTDNA to share your name and email address with our Molyneaux DNA Surname Project or someone who matches your genetic fingerprint exactly. Joining our surname project at Family Tree DNA will allow you to get special group pricing. View complete information and pricing on their current offerings: > Join or View Our Family Tree DNA Group. Only by ordering through the surname project can participants receive the group pricing. If you have already tested with FTDNA you may request, via e-mail, that your results be transferred to the Molyneaux Surname Project. If you are not sure how to go about that contact FTDNA or email our DNA Surname Project Coordinator at dna@mx-world.org, include your name and kit number and I will request the transfer. 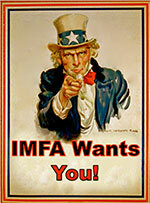 Through the generous donations of IMFA members there are a limited number of $50 grants available to IMFA member's to reduce the cost of your test. IMFA considers DNA testing and the Y-DNA Surname Project to offer significant opportunity to further our knowledge of the various branches of MX families and how they interconnect. Autosomal DNA (i.e. Family Finder, 23andMe) attempts to find cousins on both the father's and mother's side within the past 5 generations. This compares to the Y-DNA test used in our surname project which looks back 25 generations or more at the male line only. mtDna traces the mother's mother's ... line and provides no information about the father's line. Hence this test is not useful in a surname project. Our Y-DNA Project was launched in 2005 under the guidance of Sharon Bryant. The member question and answer emails from the old website have been archived here, restricted to member access only.